You'll be £14.99 closer to your next £10.00 credit when you purchase The Murder that Defeated Whitechapel's Sherlock Holmes. What's this? The author takes the reader through the investigation in great detail using records from the time period and trial transcripts as much as possible. This crime took place 100 years ago but boy how things have changed since them. This book would be a great pick for true crime lovers or anyone interested in police work. The writer has done a great deal of research and his skill as a writer is evidenced in the way he seamlessly creates an involving narrative that never calls undue attention to it. This is a quick read, being a mere 187 pages, and it will keep you guessing, and questioning. The photos add to the mystery. 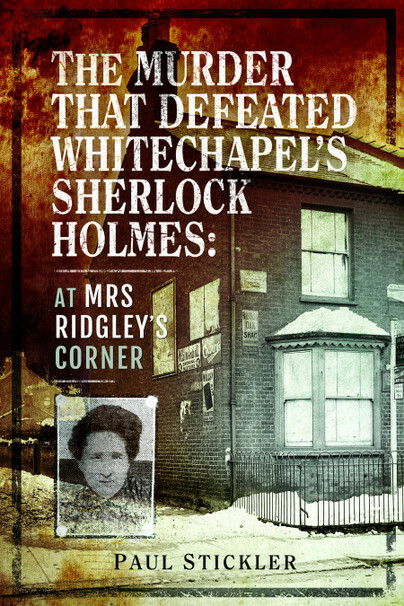 Paul Stickler has done an intense job of research into Mrs. Ridgley's murder/accidental fall. Who knows..and the mystery continues! Paul Stickler describes the events of February to July 1919 from the point of view of the participants and then provides a chapter of commentary on the investigation, the trial and questions that weren’t answered. The storytelling is very effective and the commentary thoughtful, bringing up important questions and setting the crime in the context of Britain in 1919. A useful insight into the time and place, as well as policing in the counties in the early twentieth century. ★★★★★ ...this is a well-written and well-researched book. There were a number of well-publicised murder investigations in the early 20th Century and although this was not one of them, many of those cases were undertaken by the Yard’s foremost detective, Fred Wensley, as he did on this occasion. In 1919, a woman who owned a shop in Hertfordshire was found battered to death, as was her dog. The initial investigation was horrendous; the local uniform superintendent wrote this off as an accident, which prompted the county’s chief constable to ask for Scotland Yard’s assistance and Wensley was sent, some 10 days later. It’s not a spoiler to say that Wensley was unsuccessful – that’s contained in the book’s title – but this book explains why and whilst much of Paul Stickler’s information has come from the depositions used in the case, it doesn’t read as though he’s quoting directly from the statements. He has written a very clever narrative which draws the reader into the investigation and which makes this a very readable book, indeed.